In 1994 the genesis of this sanctuary was revealed to Donna. She walked away from what she believed was a ‘conversation with God’, in shock. Her body tingled and her breath was taken away. There was no question in her mind that she was shown her primary purpose for being on this earth. She will tell you that this ‘conversation’ showed her a future that would be the culmination of all of her life experiences and everything she believed in and dreamed of. What she was shown was a retreat center on a large piece of land with big barns filled with all sorts of animals, beautiful gardens and flowers everywhere. She found herself walking down a trail to a large lake sided by woods. She felt a healing, enveloping sense of peace. As she looked around she saw trails with color-coordinated flowers indicating the length of the trails. Yellow flowers for a one mile trail, purple flowers for a two mile trail, etc. A big rustic lodge had a centerpiece kitchen with dining tables and chairs scattered throughout the main floor. Massive stone fireplaces, high timbered ceilings, comfy but simple bedrooms, and bathrooms with big soaking tubs reflected an eclectic theme of comfort and simplicity. Nestled about the grounds were fire pits and cozy seating arrangements. Included in the main lodge was a uniquely square auditorium with large descending sections going down to a stage. These sections of wide floors were filled with comfortable, obviously donated, couches, lounge chairs and recliners. The intimate design was meant to feel like the speakers or performers were in a warm and inviting home. More sleeping arrangements were nestled into creative yet functional buildings, all reflecting the unspoiled nature around them. A bunkhouse, connected to one of the barns; a greenhouse creatively incorporated more bedrooms along with a real indoor garden; a boathouse which housed more bedrooms along with canoes. There were no electronics in the bedrooms. Guests had an opportunity to disconnect from the world and step back into the peace of nature. Incumbent upon visitors was the expectation of an extended quiet time while there – be that in a canoe, with a horse, on a walk, with a book, in the gardens, or whatever was healing and calming for that person. The main messages that she got during this ‘conversation’ was that folks would come here to heal their souls, that if she just kept seeking Him that when the time was right He would bring together all the money, land and people needed to build this place. This was the pictures that she was shown in 1994. Over the next twenty-some years, while she raised her family and continued to grow in life experiences, that original vision of a retreat never left Donna’s mind. She knew it to be a sanctuary – a refuge from the stresses of life. She took as many human footsteps as she could to prepare for this including becoming a Master Gardener and Master Naturalist, but after a few years of waiting, rather impatiently, she let it go and worked on building her faith in all that is good, love and life. Never forgetting. 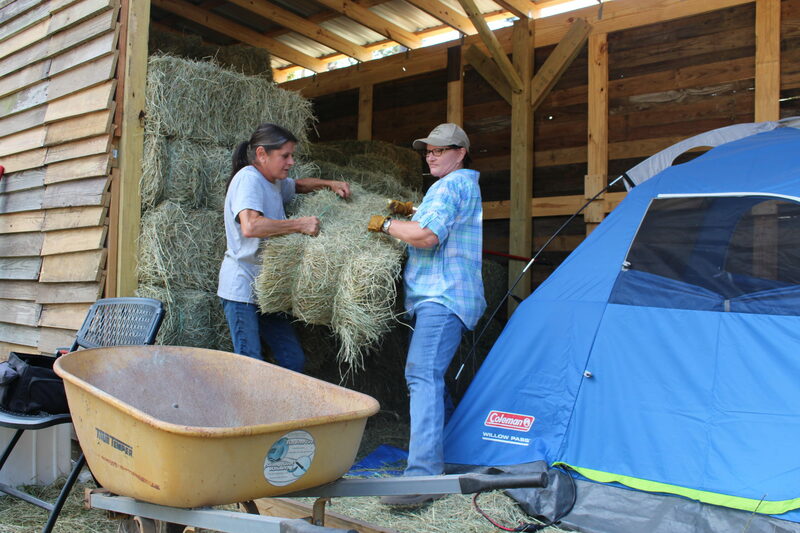 Unbeknownst to her, this ‘purpose for her life’ started to take shape as a sanctuary for donated and rescued horses in February of 2012 with the adoption of her first two rescued horses, Henry and Lexi. It became apparent to her, and those who rode with her, that spending time with these horses and out in nature heals people. 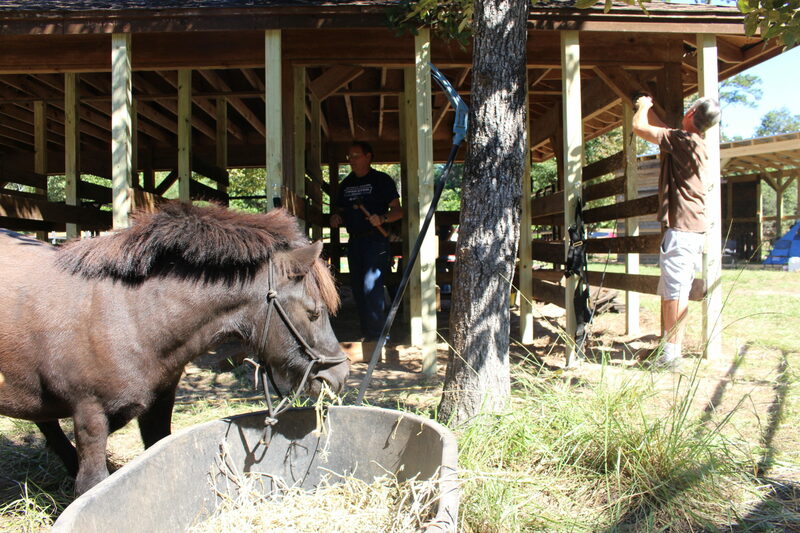 A three year period transpired during which the sanctuary grew with more adopted horses and more people coming to spend time with them. 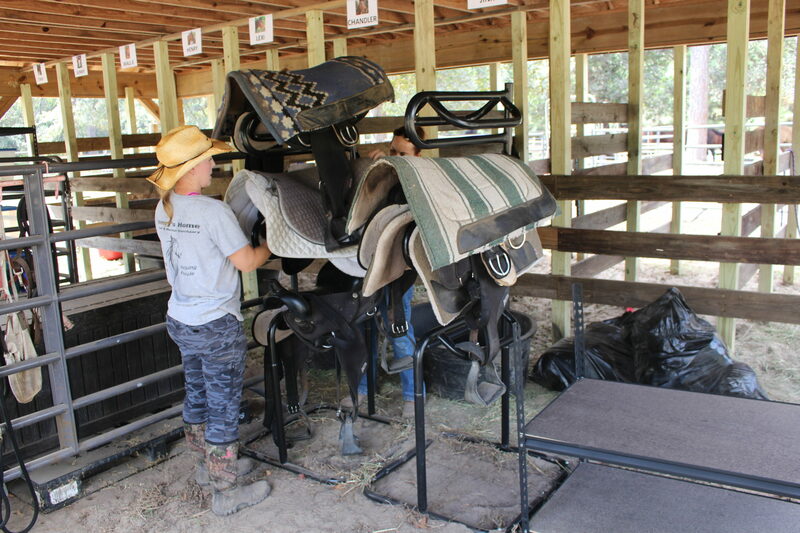 She opened a small trail riding business she named Just Us Gals to help pay for the costs of the horses. Finally towards the end of 2014 while sitting around a campfire with some of her regular riders, “it” clicked in her mind. This was the vision she had been waiting for. He was in the process of building it, even if in a completely unexpected way. 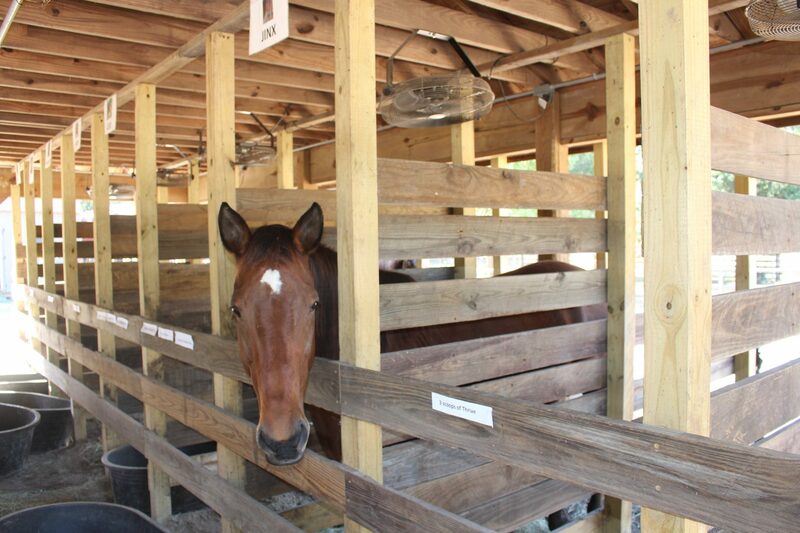 A sanctuary for horses, yes, but even more important, a sanctuary, a place for healing, for people. 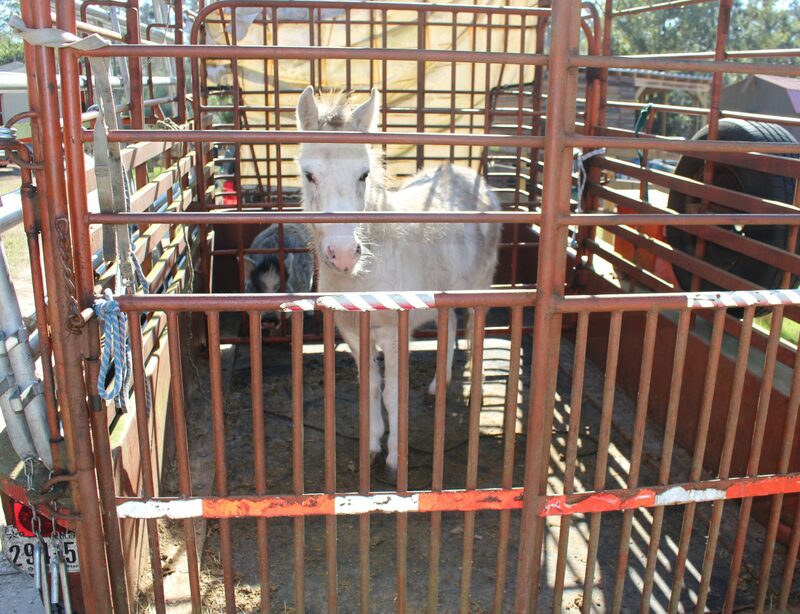 So she incorporated it into a 501c3 non-profit and named it Henry’s Home Horse and Human Sanctuary after her beloved horse Henry who had been such a loving soul to all who met him, rescued from the brink of death for an obviously very important purpose. In July, 2015, the Houston Chronicle wrote an article about a neighborhood dispute that was occurring due to this non-profit in their neighborhood. One of the leaders of a large development company, Johnson Development, saw that article and Donna was asked if she would like to move the sanctuary to the land that they had just purchased, soon to be called Grand Central Park. 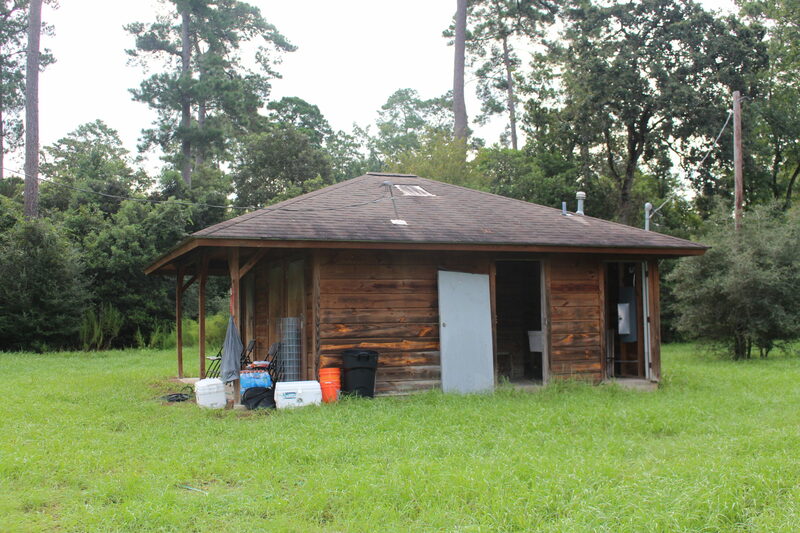 It had been Camp Strake boy scout property, and was located just a few miles away from where they kept the horses. 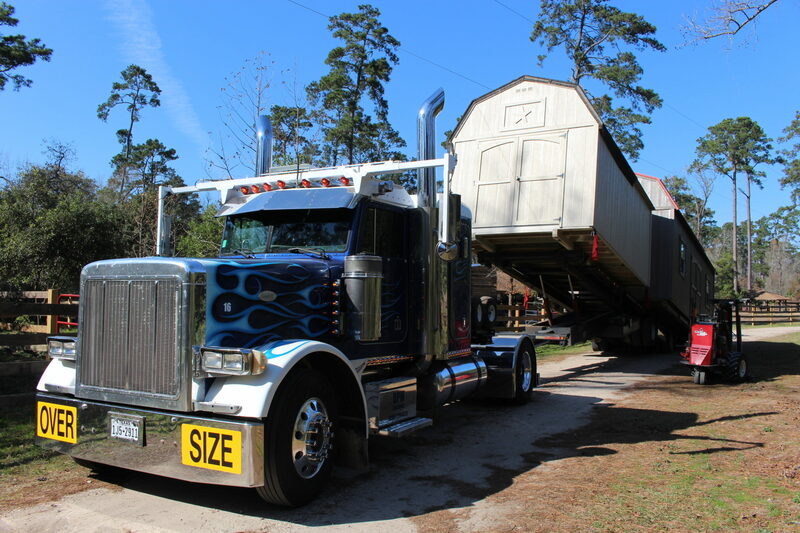 After almost a year of keeping the horses at the private home of one of their executives, the horses were moved in September, 2016, onto their new land with only a perimeter fence, a hay shed, a couple of old sleeping pavillions as shelters for the horses and a working bathroom. 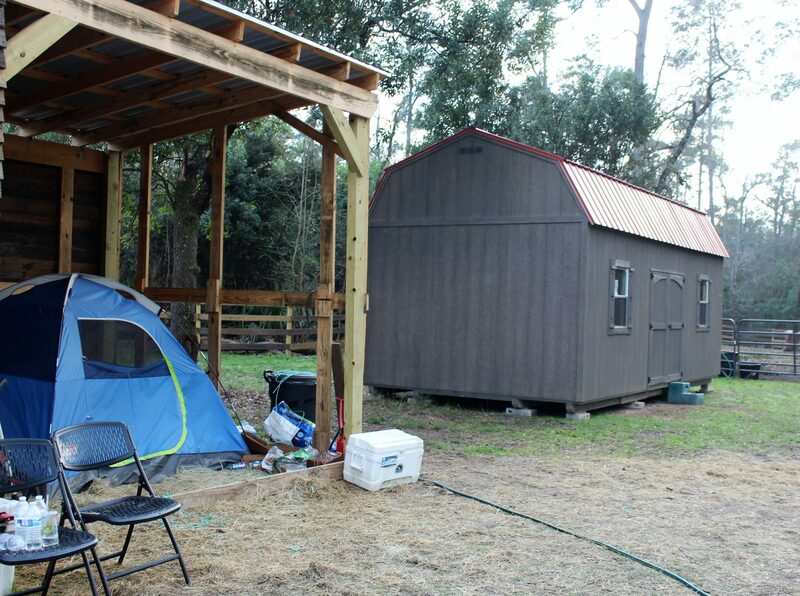 It was very primitive, in fact Donna was sleeping in a small tent under the hay shed for months, but it was in the middle of 1,200 acres of woods and very peaceful. Since that move, Donna would tell you that it is obvious that God is growing this sanctuary. Leadership Montgomery County, another 501c3, chose it as their project for the Class of 2017. They built out the arena, got an large portable office building donated, got plumbing and electrical put in throughout, helped with marketing and put on the ribbon cutting for the whole community, getting over $120,000 in in-kind donations. 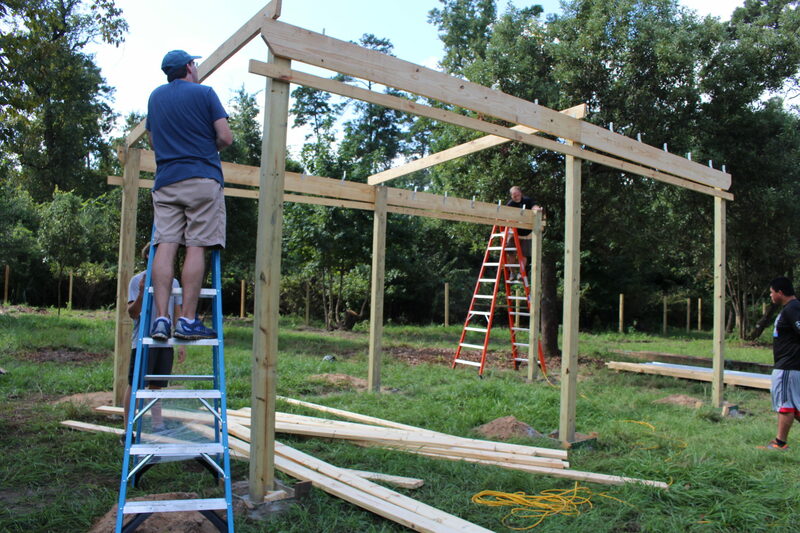 Numerous local corporations have contributed both time, work and money to help grow the sanctuary, along with a number of boy scouts doing their Eagle Scout projects, and other non-profits who have supported this group with grants and donations. 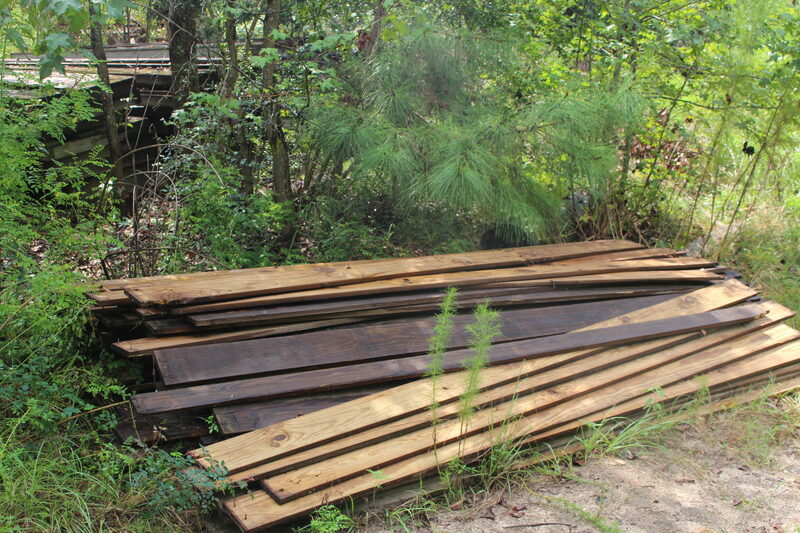 And Johnson Development continues to support the sanctuary with everything, as needs arise. Henry’s Home has taken in a half dozen more horses/mules/donkey’s since the move, as well as a pig, a dog and a half dozen cats, all of whom make it feel more like a family home. And all of whom have been donations from rescue or unwanted situations. Horses & Heroes Equine Program that offers equine therapy for local veterans, and now first responders, and their families, at no cost to them. That has been up and running now for about a year. We are working with numerous veteran non-profits to help bring us local veterans, and it appears to be life-altering for those who attend. And our Herdmate Program helps to attract and train anyone over the age of 18 who wants to get involved in helping to care for the animals and the farm. 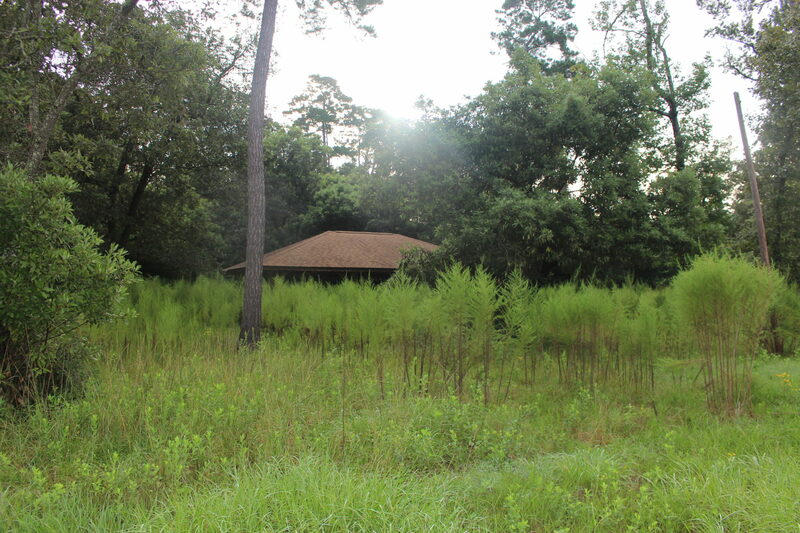 The land at Grand Central Park was partially cleared with a couple of sleeping pavilions but had sat doormat for several years so was pretty overgrown. There was an old but working bathroom which felt like pure luxury to us after the porta potty we had used for years. 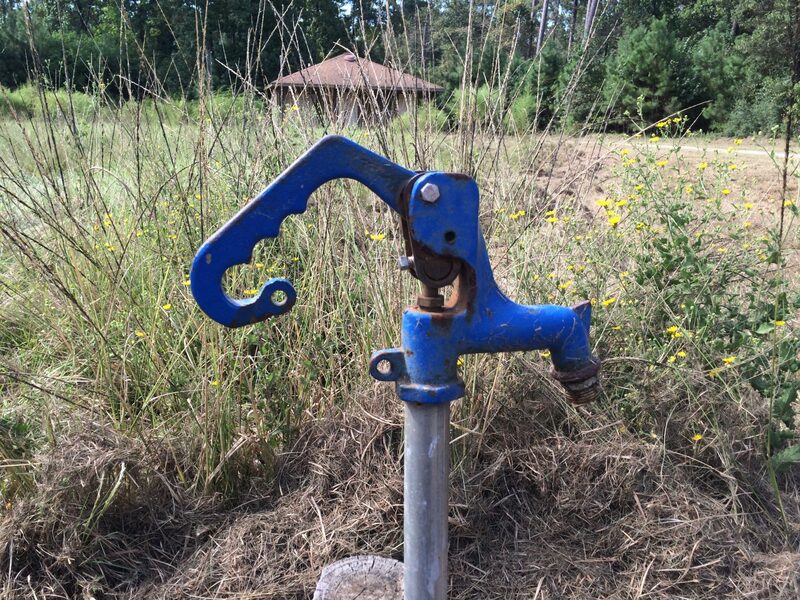 Each pavilion had a water pump close to it. Ours worked, although they leaked even with some repairs. We were happy to have water. 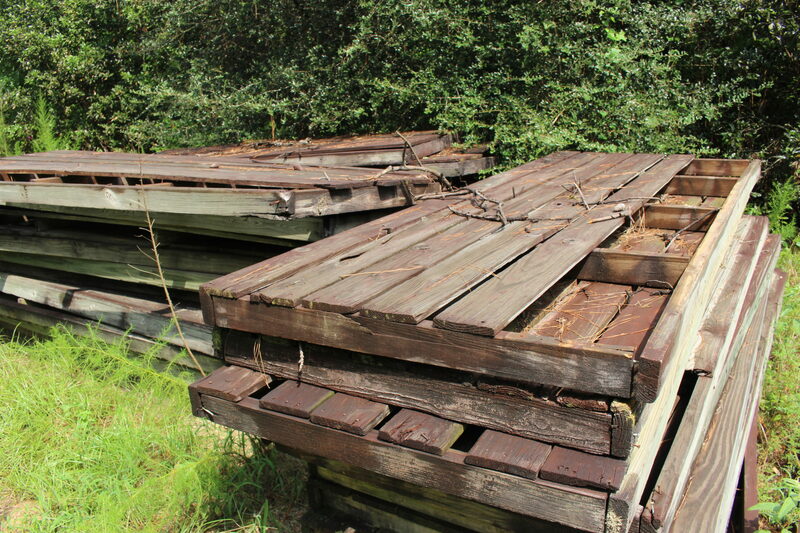 Johnson Development donated the hundreds of sleeping pallets to us if we wanted to pull the boards off them for fence boards. 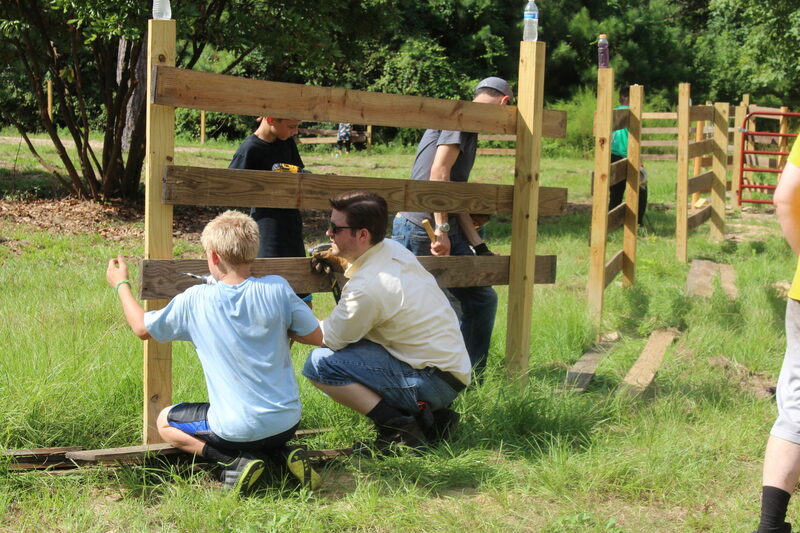 It took a grueling month to pull all those boards off in the hundred degree days of August, but we felt blessed to be able to re-use the original boy scout wood for our fences and building sidings. 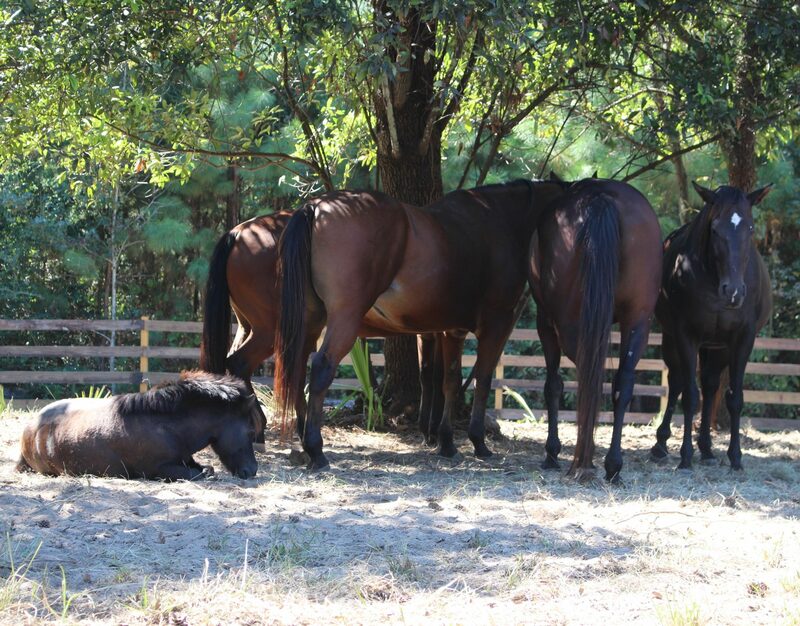 Next all the huge bay and hardwood trees had to be pruned to make them perfect shade trees for the horses. 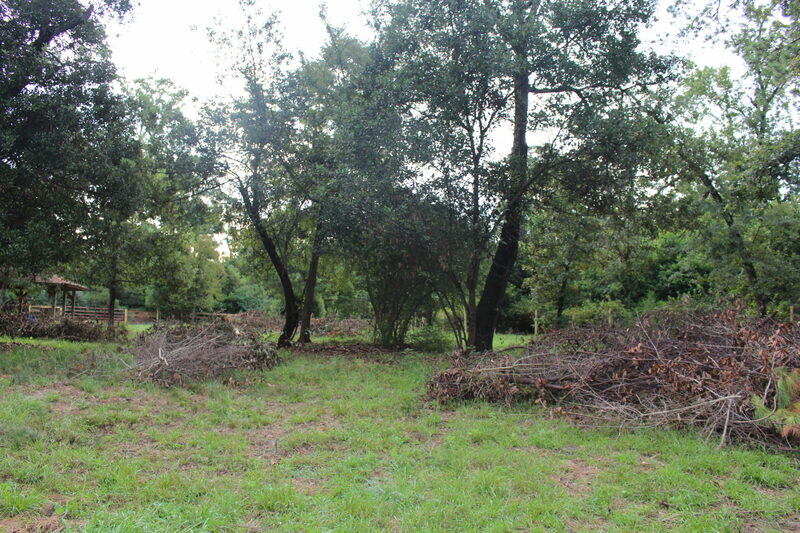 That work as well as cutting out all the brush took the month of September. 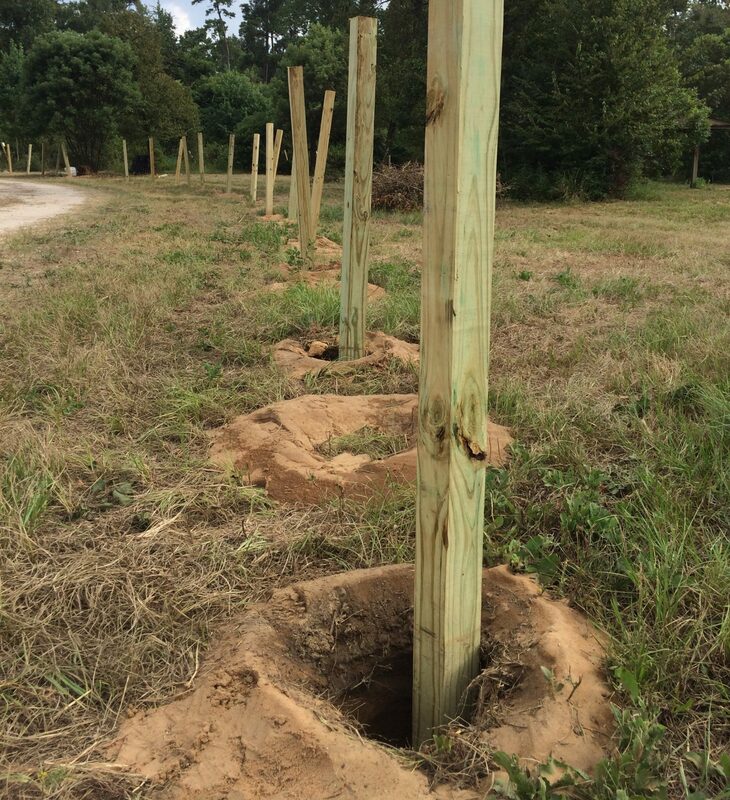 Post holes dug for the perimeter fence of the pastures. That and the hay shed were the prerequisites for moving the horses here. Gates were up. 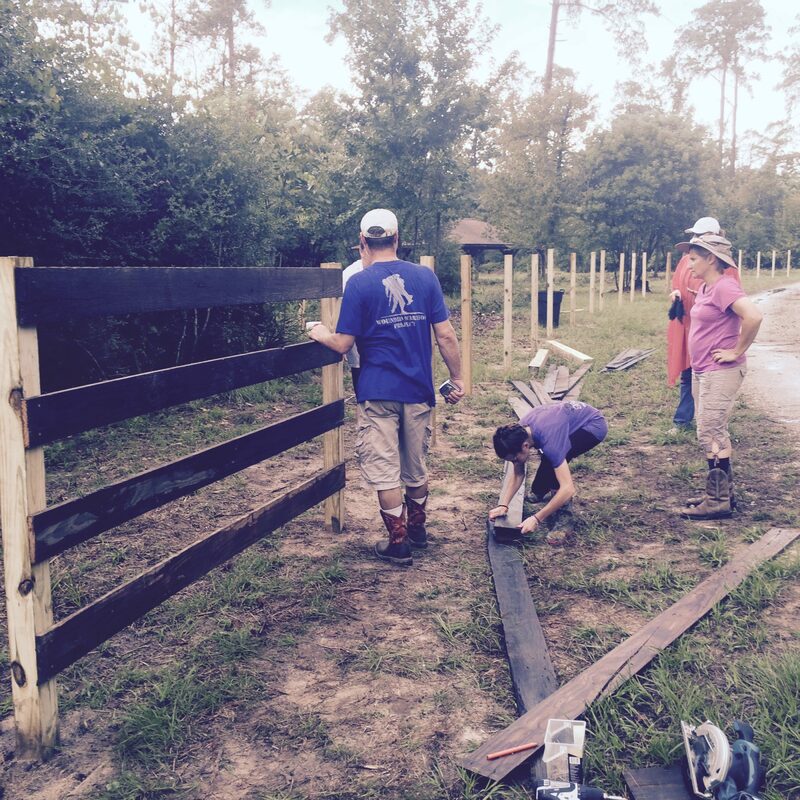 Now our herdmates were getting started on those perimeter fence boards. 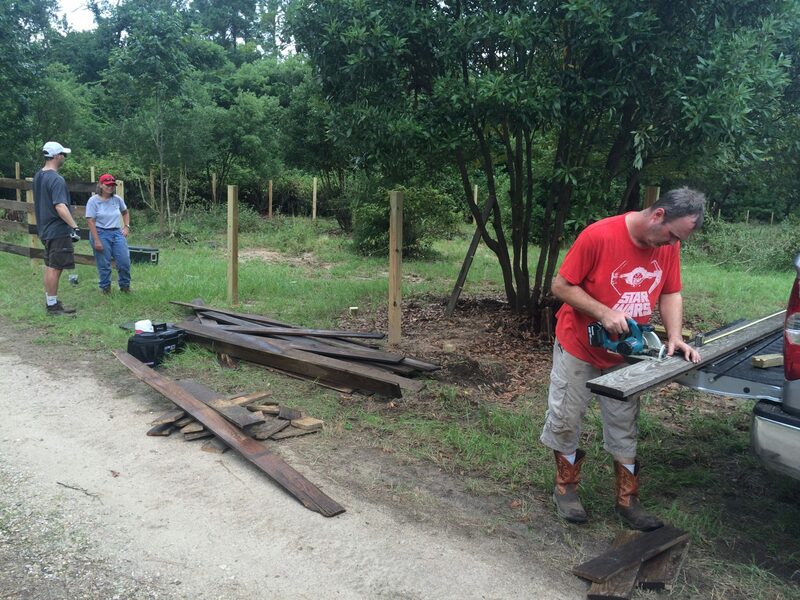 Each 9′ board was filled with about 16 old rusted nails or screws that had to be removed and then both ends cut off to fit into an 8′ post space. We didn’t get far before we figured out that this was going to take us months to get done. We needed help. 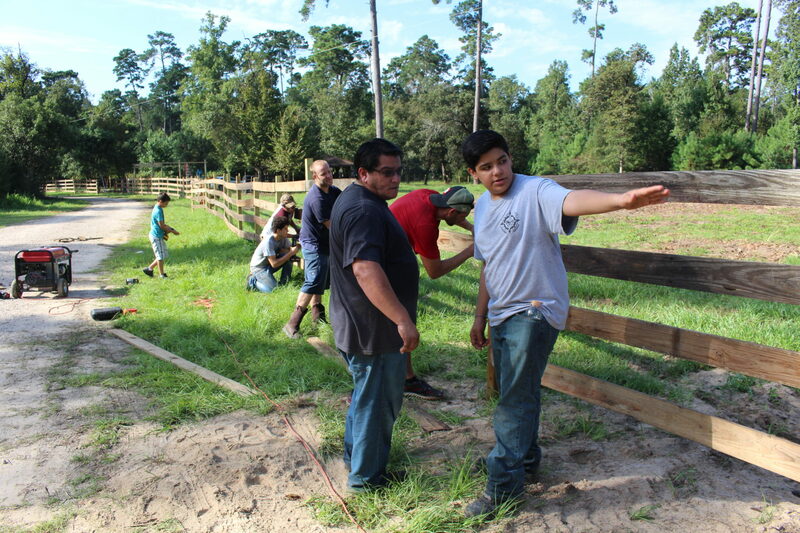 Rafael Martinez, the Land Manger at GCP, just happened to have a son who needed to complete his Eagle Scout project. Over two long weekends, they got all the boards up for us. Thank God for boy scouts! The other thing we had to have up was a hay shed. 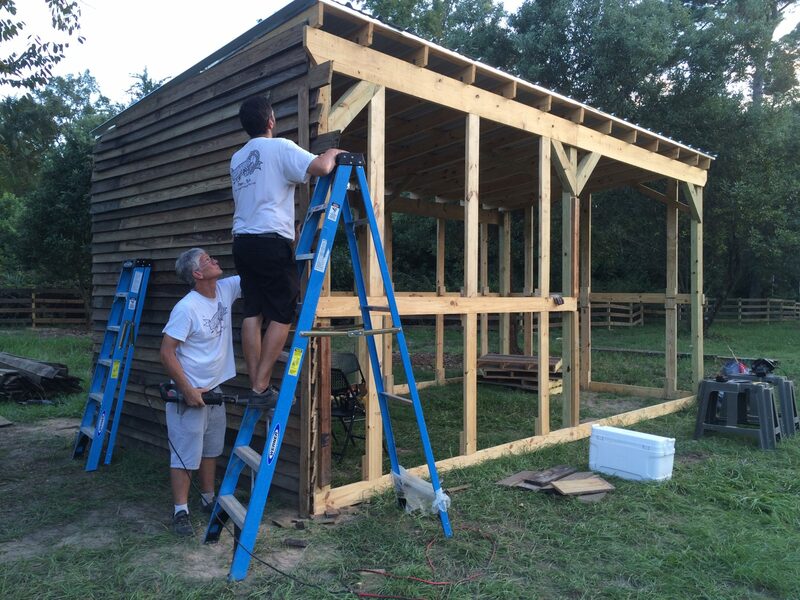 It took this scout and his dad just a couple weeks to get up the primary structure of our shed. Our herdmates completed the siding of the hay shed enough to get our first load of hay delivered. We were ready for the horses! Hay! Donna slept in this small tent for the first four months every night. Mama Lion! She was not gonna let her family stay here without safety supervision. 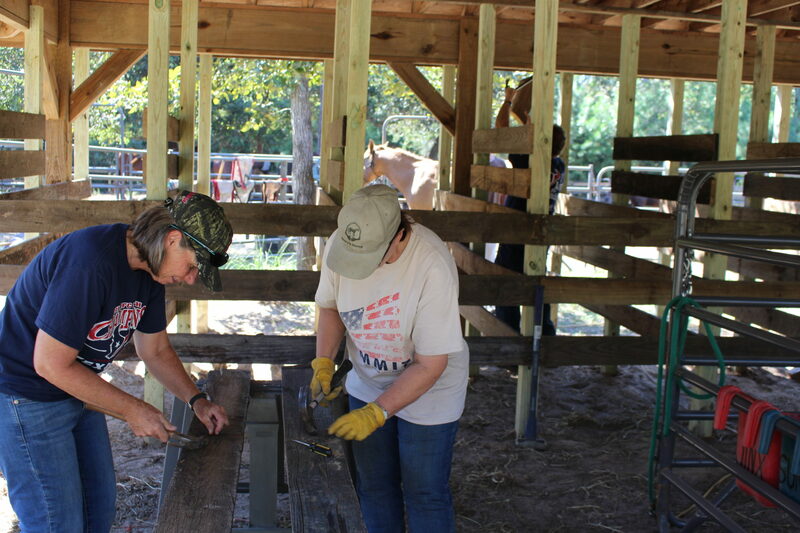 Next project for the herdmates were building feeding stalls. 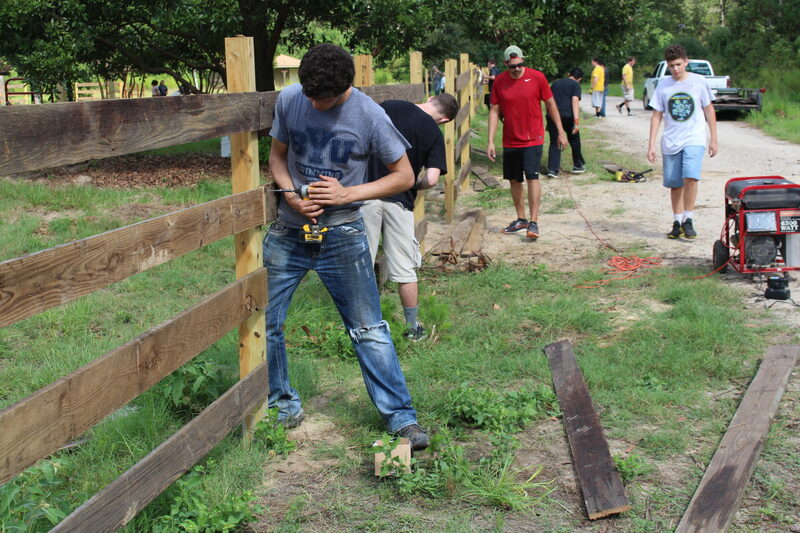 Taking screws and nails out of every board was painstaking work. Of course there has to be a supervisor on every job. Willie Nelson was happy to volunteer for this one cause it meant food for him. First feeding. They got the hang of it right away. Didn’t take us long to get fans set up in the stalls. Sure made Miss Jinx happy. 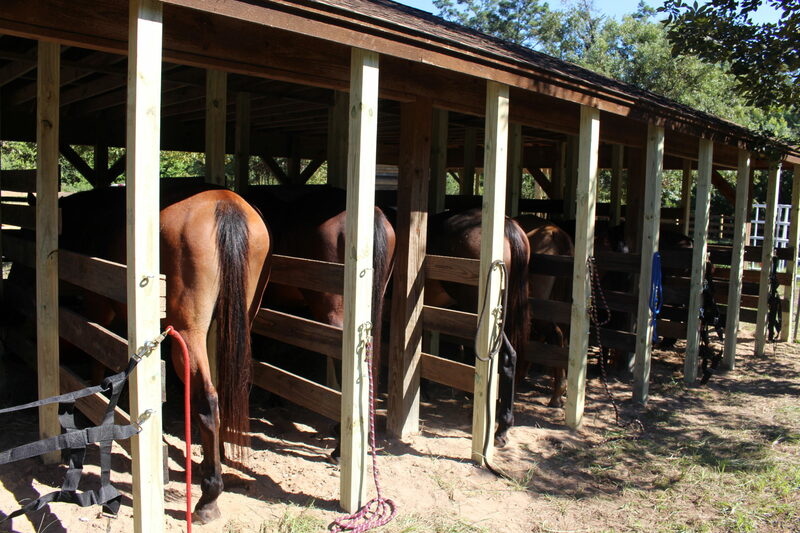 We were so grateful for a covered area to keep our tack and supplies. But boy did we need some type of building to keep stuff in. Our dear friends, Bob and Susan Graves, asked us what our greatest need was. 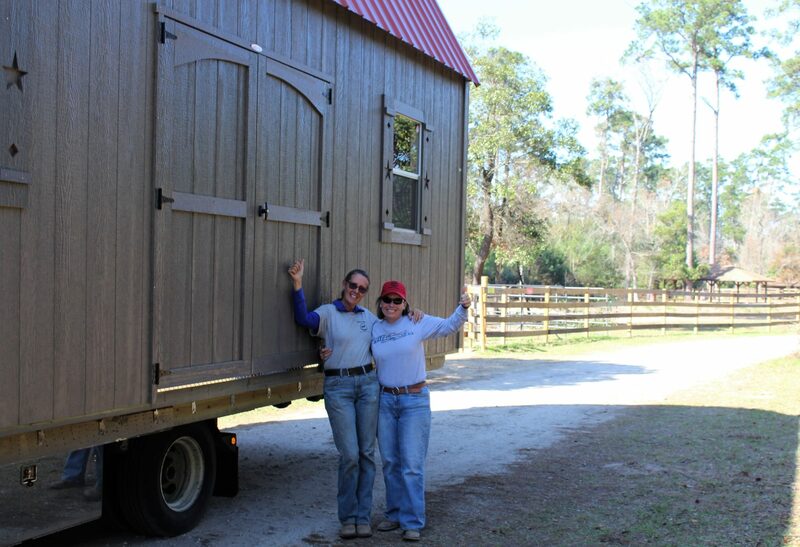 We said a tack shed. They wrote us a check. Starting to feel like a real place. 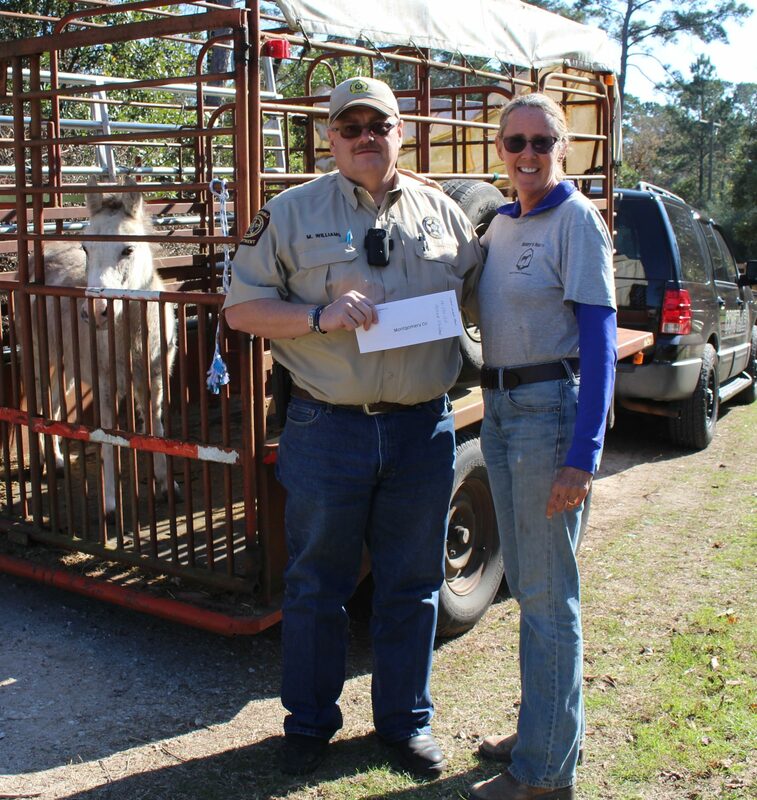 Same day we got our tack shed, the Montgomery County Constables dropped off a mini mule they had found along the side of Highway 105 in Conroe. The constable’s deputy told us that he also brought her roommate in jail who she would be unhappy without. Augustus McRae! We knew absolutely nothing about pigs. But we all fell in love with him that first day. 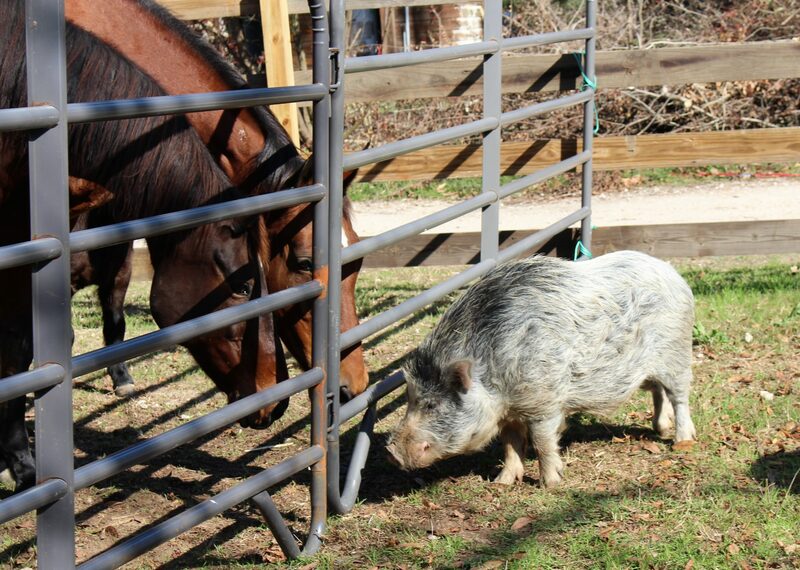 He was the perfect meet and greet pig! So ugly that he was adorable.